The Larson Electronics SPLT-1.06K-LM30-8XWP600E-AT-BC-MOD1 solar powered LED light tower provides a safe and effective way for operators to quickly deploy 240 watts of intense LED illumination to elevations up to thirty feet. This solar light plant features a telescoping light tower that folds over for easy transportation, a rotating boom that allows for 360° rotation and a removable mast head for storing the four LED light fixtures when not in use. The 12V unit features four 265 watt solar panels and a 3,000 aH capacity battery bank. The entire assembly is mounted onto a 7.5` single axle trailer (federal safety orange), allowing operators to transport this solar light tower from location to location. Solar Powered Light Tower: This solar light tower includes four solar panels, solar charging system, battery bank, battery charger and manual crank up mast mounted on trailer with outriggers. The 1.06 kW solar generator system replenishes amp hours of usable battery capacity per day, assuming 5.5 hours of peak charging sunlight. 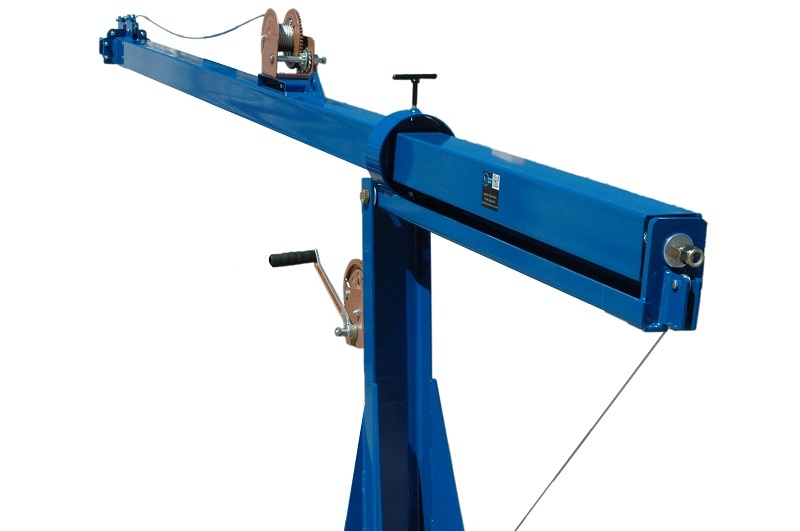 This system delivers 12 volts for lighting mounted atop the 30` telescoping light mast. The SPLT-1.06K-LM30-8XWP600E-AT-BC-MOD1 is supported by twelve, 250aH 6V lead-acid batteries, equating to 3,000aH battery capacity (1,500aH usable). A charge controller provides accurate readings during deployment. Designed for solar array voltage monitoring, wiring connections to the solid-state controller are faciliated by locking-type multi-pin connectors and includes an auxiliary 12V connection for other devices. The unit automatically switches outgoing current off, when battery voltage decreases below 10.7V. A switching regulator battery charger with automatic switch to maintenance or trickle charge is accessible on the system. This component features an input voltage of 110V AC 50/60 Hz and an output voltage of 13.5V DC (90 amps). 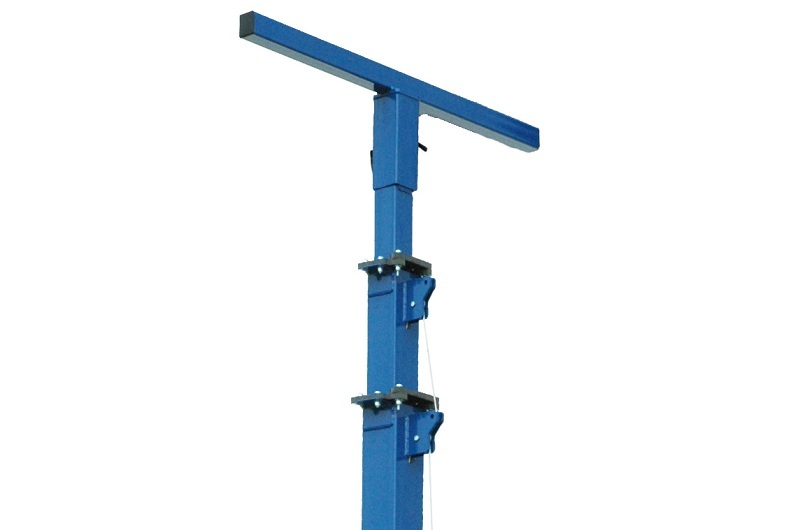 Light Mast: This telescoping three stage steel light mast from Larson Electronics’ is designed to allow operators to quickly and safely deploy the four LED light heads in locations where this equipment must be elevated to heights up to 30` for effective coverage. Assembled with removable, rust-resistant, lockable fasteners, this light boom can be extended to 30` above the trailer floor for maximum area coverage, and collapsed to 13.5` for applications where a footprint smaller is required. The tower is constructed of square steel tubing with a base section 6.6` in length and 6" by 6" by 3/16" thick, lower section 6.78` in length and 5" by 5" by 3/16" thick, middle section 6.93` in length and 4" by 4" by 1/8" thick, upper section 7.08` in length and 3" by 3" by 1/8" thick, and top section 7.58` in length and 2" by 2" by 1/8" thick. Each section has a 1`+ overlap. The mast is extended to its full height using an included 1,000lb rated hand winch (zinc-plated) with 3/16" galvanized steel cable. Trailer Assembly: The entire assembly is mounted to a 7.5` by 7`, single axle trailer via six 1/2" anchor bolts. The two-wheel trailer is equipped with 3,500 lbs torsion-type axle that features independent suspension and leaf springs with 15" trailer tires. For wheel bearing lubrication, the axle wheel spindles are equipped with grease fittings. A standard 2" ball coupling, two standard 0.25" safety chains, snap-type hooks and 7-pin flat trailer plug allow for easy hookup and towing. The 2.5" x 2.5" x 0.1875" trailer tongue is constructed of steel tubing and can be removed for long term deployment. This component is bolted to a formed steel plate assembly and is equipped with an additional, removable hitch pin (all hitch components adhere to SAE J684/Class II trailers) for seamless pivoting (upwards) during storage. A rugged and waterproof job box is included, safely secured to the trailer. Four outriggers mounted to the corners of the trailer allow operators to level the trailer, and provide stabilization during deployment. All trailer lighting complies with DOT/FMVSS regulations. Trailer wiring harnesses are sealed and water resistant. The assembly features a maximum trailering speed of 70 mph. A 2.5" x 2.5" 0.1875" structural steel tubing receiver, which accepts standard Class II drawbar and hitch pin, can be used for tandem towing and is suitable for off-road use only. This component contains a powder-coated federal safety orange finish.